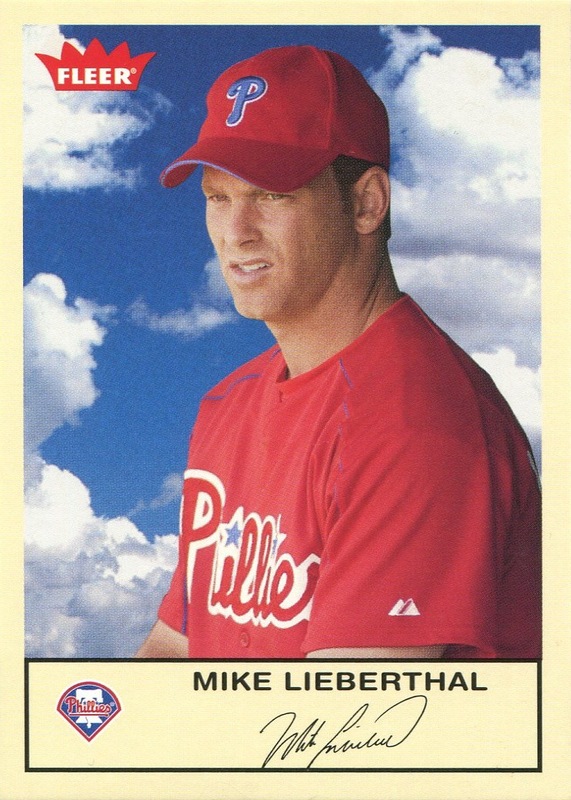 This morning I discovered in my possession a Phillies card that doesn’t officially exist. 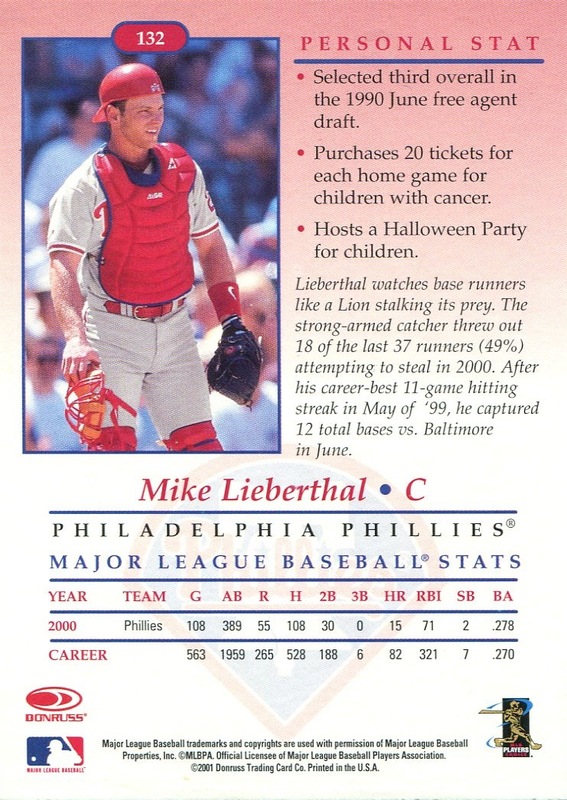 The short version of the chain of events is that I came across the Lieberthal card shown here while continuing my on-going project of merging together the collection of cards an old high school friend gave me (which I mentioned previously on a few separate occasions, most recently a few weeks ago) with my rag-tag collection of Phillies duplicates and non-Phillies cards. 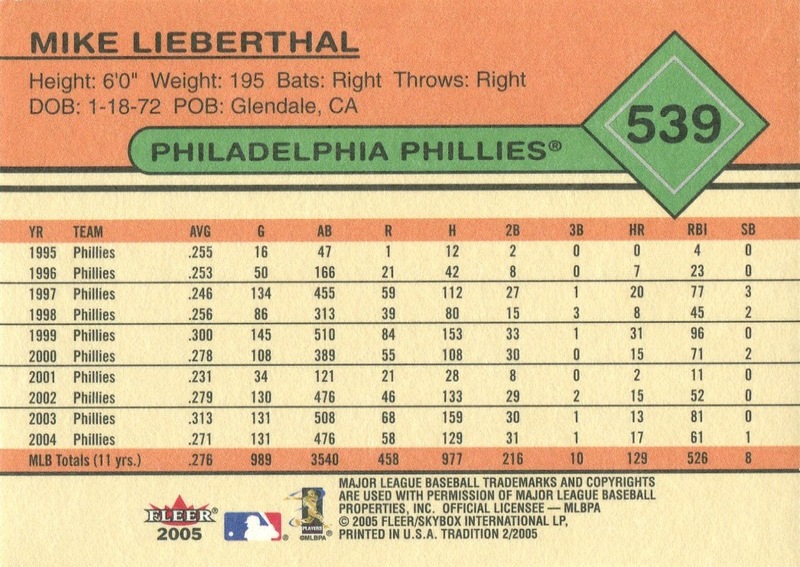 As part of this particular project, I am putting together an Excel spreadsheet listing all the cards in this new collection, which is a completely separate entity from my Phillies collection. While cataloging, I make use of both my most recent copy of SCD’s Standard Catalog of Baseball Cards and Beckett’s online guide to make sure everything is denoted properly. Well, when I searched for the Lieberthal card, I was stunned to find that it bore a higher number than any listed by either Beckett or SCD. Then it occurred to me to use my own personal Phillies database to how I listed it there. Amazingly, I didn’t have it in my own collection. This led to more searches of online resources (such as The Trading Card Database) that also came up empty. What the hell was going on? After some more hunting around online, I think I finally pieced together what I own. Just before it declared bankruptcy and ceased operations, Fleer actually started production on a second series of Fleer Tradition. A small number of these cards somehow got onto the market — a few years ago at least one dealer was selling them on eBay, and that same dealer also appears to have sold them through Becket Marketplace (although that storefront is now defunct). 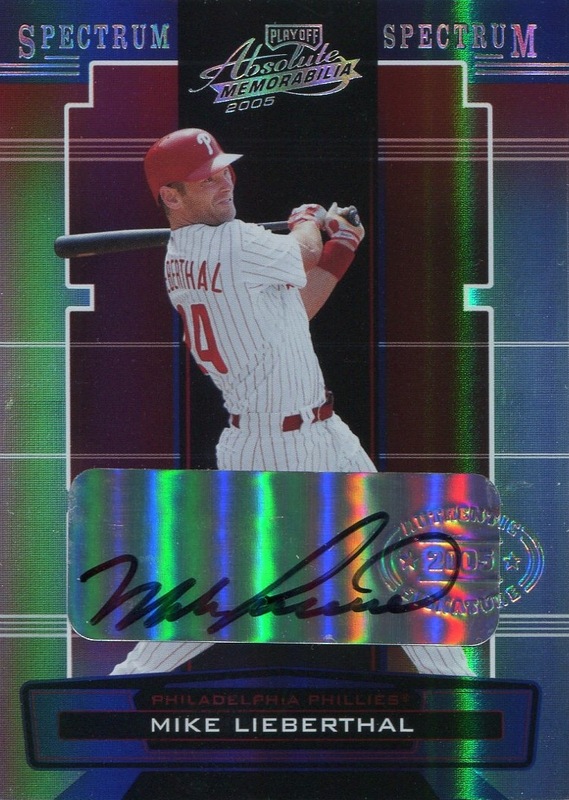 Knowing all this is well and good, but how the hell did it find its way into my Phillies duplicates pile? Best guess, and this is only a guess: it somehow worked its way into one of the repackaged jobs that the Fairfield Company/Excel Marketing puts together for Target and dollar store chains. Yes, I do occasionally waste my money on such things, but I do it for fun and very rarely stop and check to see if the Phillies in them are already in my collection. In fact, I only do so when I have doubts as to whether that particular team set is complete. 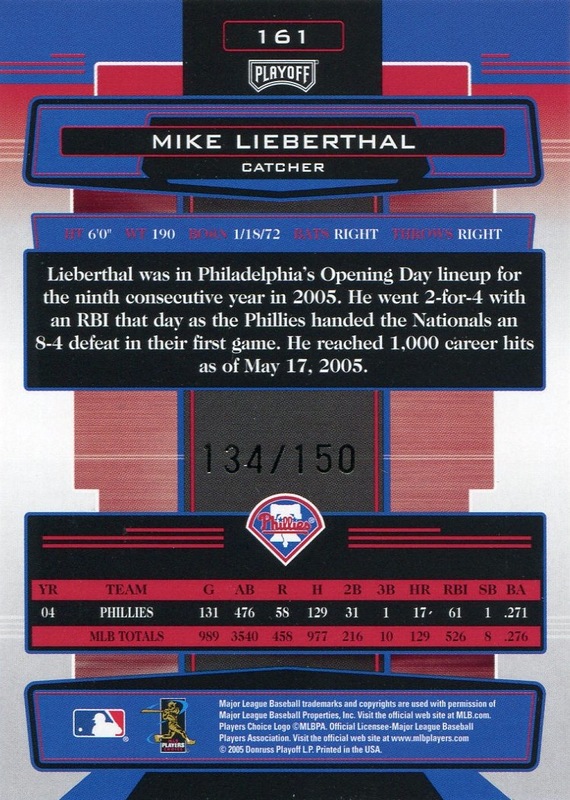 Since for the past seven years I knew I had a complete team set of 2005 Fleer Tradition, I probably never thought twice about the Lieberthal card when I first got it, whenever that was, and accordingly tossed into my duplicate Phillies/non-Phillies collection. While figuring out the genesis of this card, I did come across the list of other 2005 Fleer Tradition second series cards that did briefly make their way into production. The checklist is below. 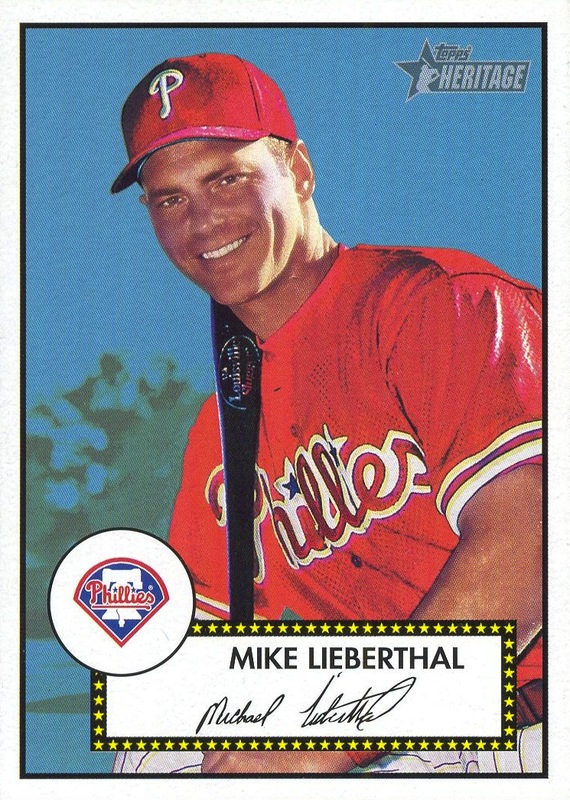 Unlike the Japanese Phillies cards I am busily hunting down, I don’t know yet what amount of time, energy and money (if any) I will allocate for acquiring the rest of these unreleased cards. It’s very likely that in this case I will be happy with just the Lieberthal, but at this time I cannot be too sure. Inserts: Diamond Collection, Leather and Lumber, Masterstrokes, Private Signings 5” x 7”, Round Trip Ticket, Warning Track. 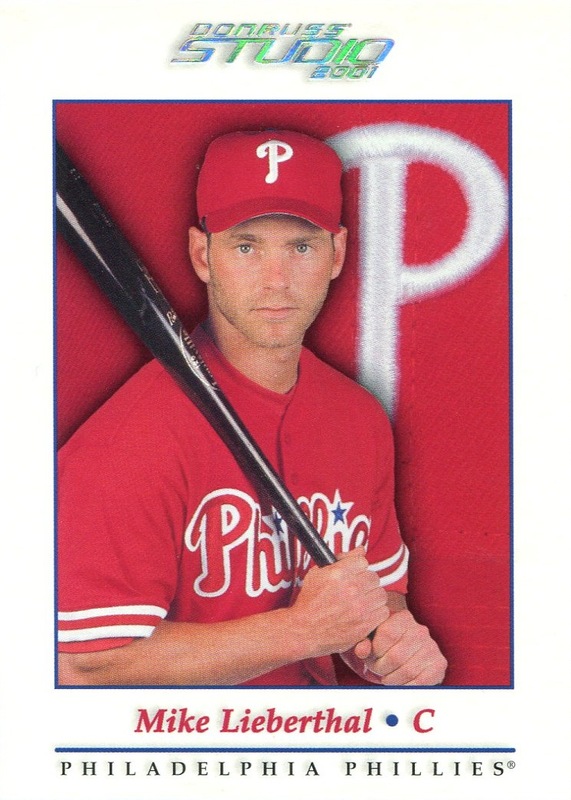 Additional Information/14,000 Phillies Commentary: The Estrada and Rollins cards are part of a Rookies subset, and like most other Donruss issues from 2001, the cards in the Rookies subset were printed in much smaller quantities than the base set. In this case, they were serial numbered to just 700 each. This is the last Studio release to place some sort of border around the photo on the front, as well as comprising the smallest Phillies Studio set of the decade (although not the smallest Studio set of all-time). Additional Information: Cards were inserted in packs of 2005 Playoff Absolute Memorabilia. The cards are essentially the same ones used in the regular Playoff Absolute Memorabilia set, only with the Spectrum parallel treatment and an autographed sticker applied to the front of the card. All the cards, regular inserts and the parallels are serial numbered on the back. 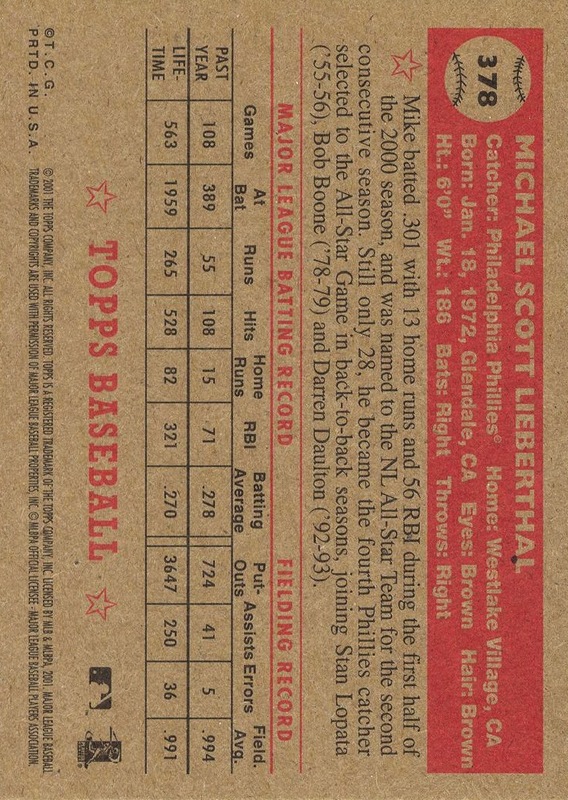 In the checklist below, the print run of each player’s card is listed in parenthesis after his name. Additional Information: One of many sets in which Topps recycled the 1952 Topps design. In what may be one of the cruelest acts ever committed by Topps against Phillies collectors, all the cards, with the exception of Randy Wolf, reside within the short-printed high number series; thus making this the most needlessly expensive and difficult modern issue for Phillies collectors to complete.